With a bit of nosing around, we can learn all sorts of things about the cities we call home. Often the stories we unearth bring us to a sad present, but just as often that sad present suggests a happier future. What in the world am I talking about? Let me explain. 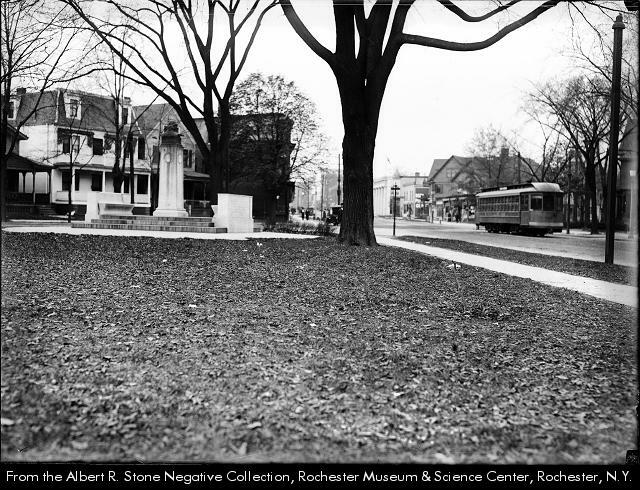 Recently, colleague Bob Williams suggested that I get to know a bit about a lost place in the Rochester cityscape: Franklin Square. 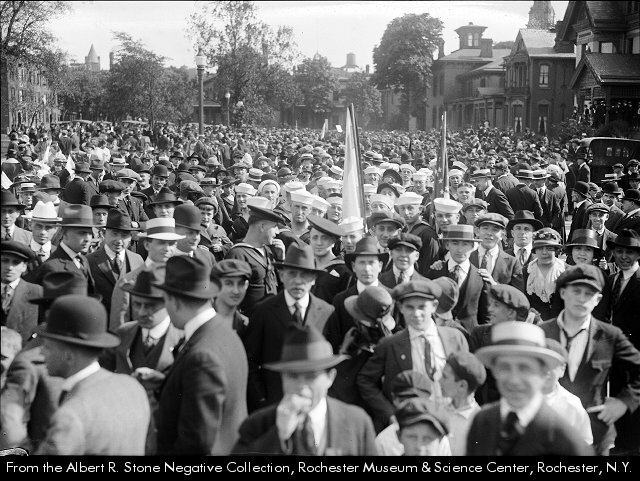 Since I have been getting to know some of these Rochester stories, and places, I have learned much about how extraordinary this place once was – really, really terrific – and how low it has fallen, mostly due to cars and sprawl. And, I think, some fairly immeasurable stupidity. The story of Franklin Square, and the bonus story I discovered in the process, is a perfect example of what afflicts us here, and in so many like cities now overrun with wide streets, too few residents, and too many cars. Pull up a chair. Herein lies the tale of two city places. 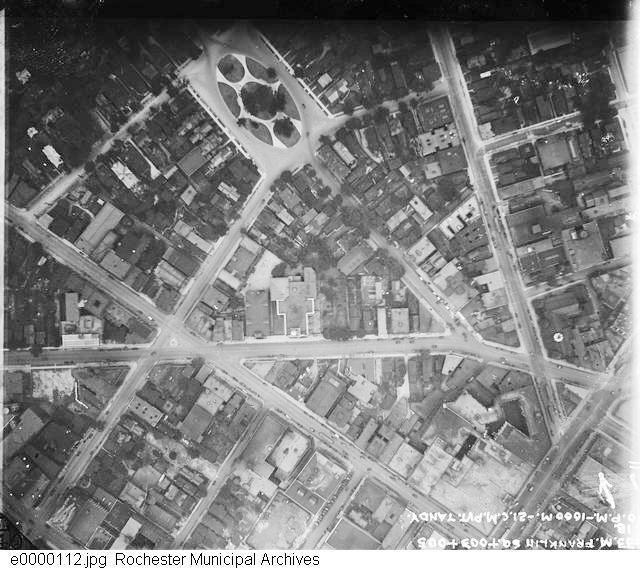 First, this is Franklin Square in a 1919 photo taken by the Army School of Aerial Photography, which was located here, at Kodak Park, during WWI. Look how dense the city was then! No surface parking lots, buildings jammed in all over the place, and a really lovely city square as counterpoint to the surrounding density. Now this is a real city. North is to the upper left. 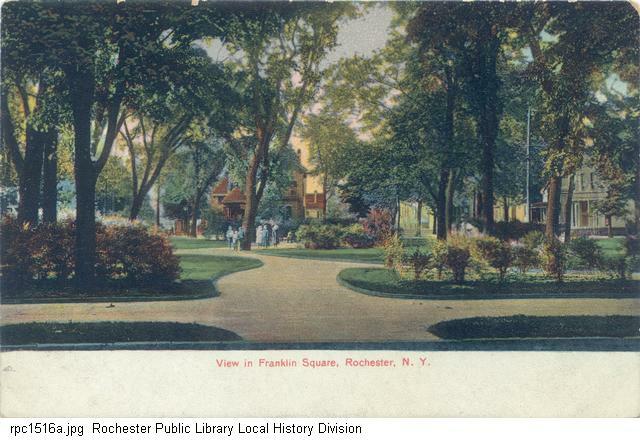 To get a better view of Franklin Square, take a look at this, from the City Plat books of 1925. Here are some undated views of what the Square looked like in its heyday. I note that the hand coloring and gauzy photography really help, but nonetheless the Square looks pretty wonderful. And from Albert Stone, another view. He took this photo in 1919. The crowds had formed in front of the Jewish Young Men’s Association, on the western side of the square, to protest the pogroms underway in Russia. 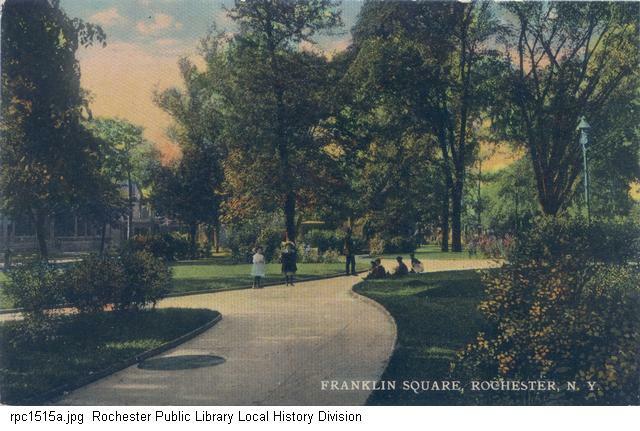 Clearly, Franklin Square (even though it wasn’t square, but ovoid instead) played an important part in the life of the city – as green relief in the dense urban fabric, as gathering place for events, as shady relief from the heat, as recreation space for children. But here’s what I found curious. 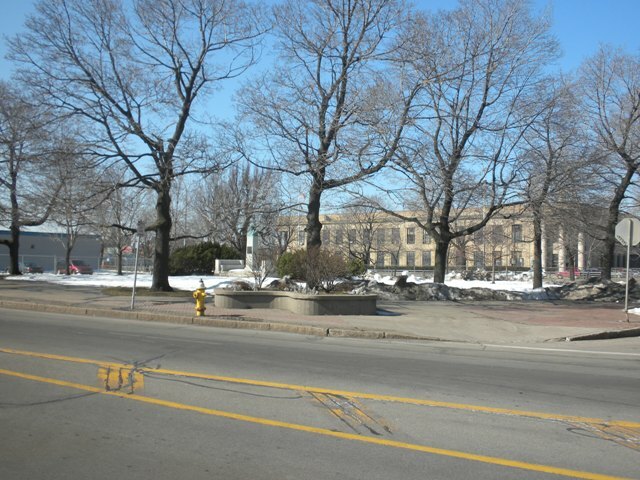 I know where Franklin Square is – all I had to do was look at the aerials and the plats. But there is nothing there today called Franklin Square. What’s there today is called Schiller Park. Here’s a view of the Square/Park today, from Google Earth. Pretty awful, I’d say. Looks like a bomb went off. Which of course is what happened. 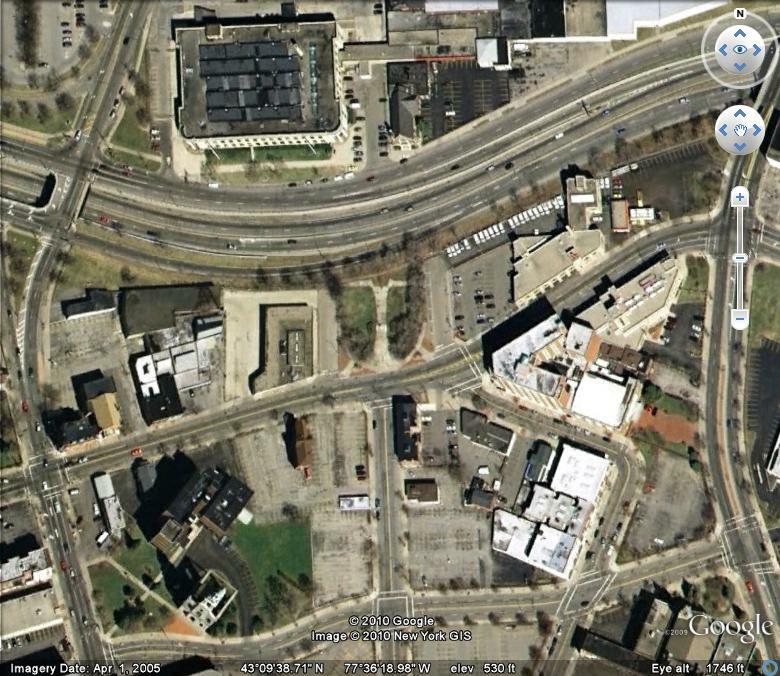 What’s left of Franklin Square/Schiller Park is just beneath the expressway, the Inner Loop. 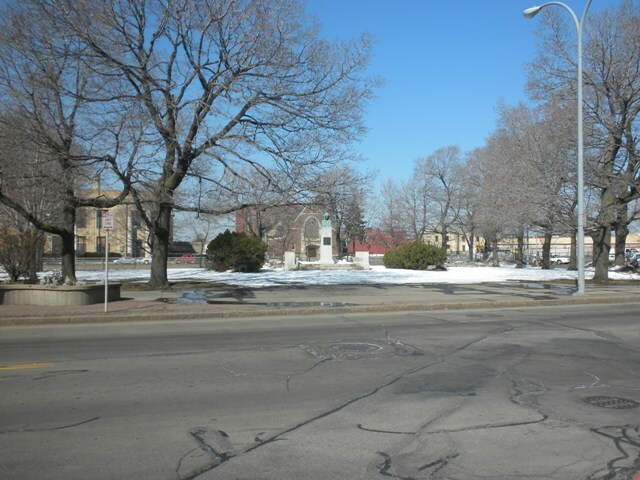 And here are a couple of views I made yesterday of what’s left of Franklin Square/Schiller Park. Schiller Park nee Franklin Square, looking northwest. Schiller Park nee Franklin Square, looking north. Only about half of the old Square remains. The northern half – at least – has now become the moat – the Inner Loop – beyond the tall chain link fence, between the Park and the old Post Office (that long two-story building, now abandoned, of course, by the USPS). The lovely oval shape is a goner, as are the surrounding roads, the big trees, the surrounding buildings but one or two, and the people. Would anyone really want to go to this place and listen to the traffic on the sunken expressway? Well, maybe. The old Square has a secret. And here is where things get pretty interesting. As I searched for Franklin Square, I saw on maps that it is now called Schiller Park. Here’s why. Yes, that’s a bust of Friedrich von Schiller, one of the greatest of German literary giants. 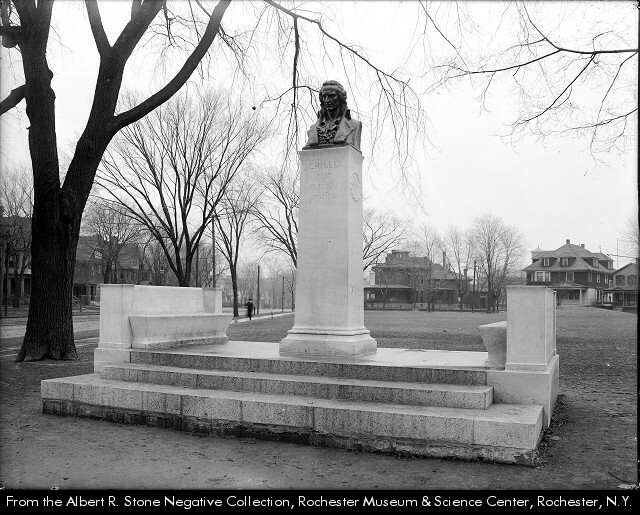 It turns out that the setting for the bust (sculpted by Carl Augustus Heber) was designed in 1908 by the very noted architectural firm of Carrere and Hastings. You might be familiar with another one of their designs: the New York Public Library. So that’s how Franklin Square got to be Schiller Park. Schiller is there. And now the story takes an interesting turn, again thanks to Albert Stone. Yes, there stands Schiller. But in this image from about 1930, he is standing in what was then called Anderson Park, just a few blocks away from where he would later end up, in Franklin Square/Schiller Park. 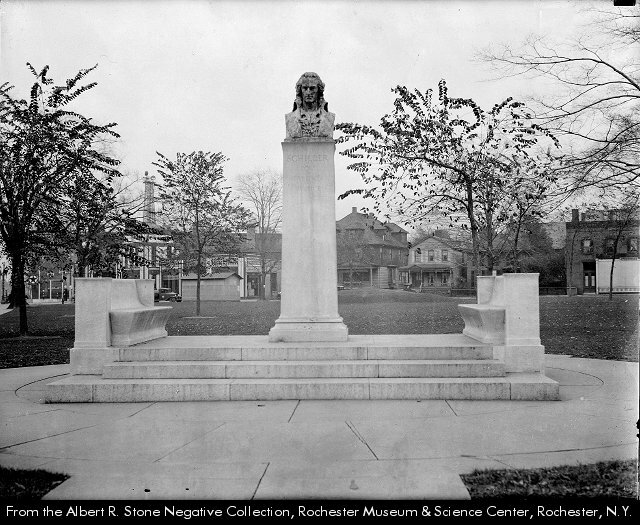 Schiller originally stood in what was called Anderson Park. 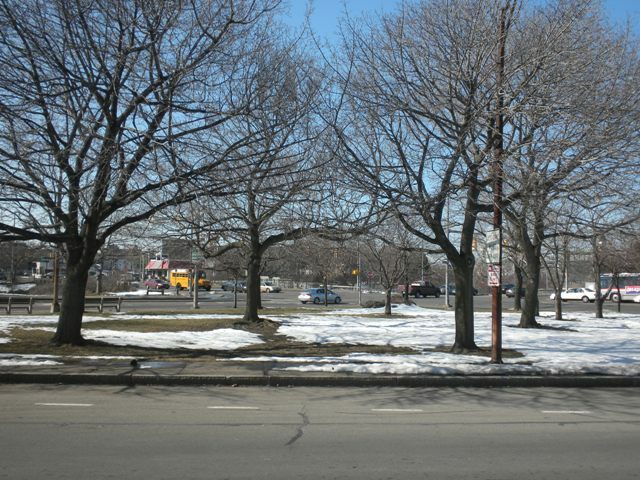 It turns out that when the Inner Loop was constructed, they moved Schiller from Anderson Park to what was left of Franklin Square, and renamed the fragmented space Schiller Park. That was in August of 1964 or so. I know this because there is now a plaque saying that the bust was rededicated on August 23, 1964. But back to Anderson Park. 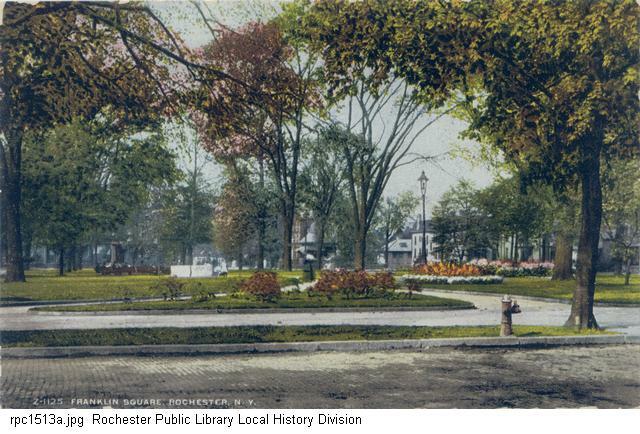 In the 1930s, Anderson Park was a nice urban space. Here are a couple more of Albert Stone’s views of the space. And then I found a really nice image, clearly indicating how important the little Park, at the intersection today of two busy streets, was to the life of the city. Take a look. 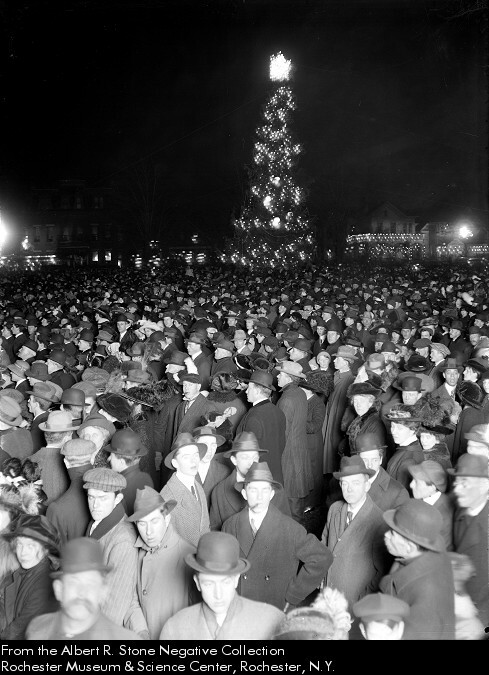 Christmas, 1913. That’s the Rochester Christmas tree, lavishly lit with the latest of devices, the electric light bulb. The Park is jammed – must have been a pretty fun place that evening. Love the hats. And now – sorry but I have to do this – and now, here is Anderson Park today. Do not look away. The bus in the middle of the picture is passing over a viaduct above the Inner Loop. Good, wide roads, don’t you think? I am not sure how to use this space today – it’s worth one’s life to get across the traffic just to even stand there, much less to enjoy the lighting of the City’s Christmas tree. So what have we discovered? Two once terrific urban places, in the fabric of a once lovely city. Two spaces absolutely savaged by cars and roads. Two places where memorable things once happened, events that didn’t save them from savagery, but events still worth recalling, and preserving. Cities hold our memories, our stories, in all of the places where we gather and stroll. And those places in turn tell us what we care about and what we think counts most. Clearly these two spaces today tell us that we no longer care about walking our city streets – we’d rather drive. These spaces today tell us that we no longer want to gather alone, or in groups – we’d rather move on, and out of the city. Passing through trumps being there. But if we should ever change our minds – and I pray we do, and soon – we don’t have to look far to find out how to remake things. The old city which has passed away is made of an urbanism, made of a way of shaping and making urban places, that is now nearly extinct. But it sure was fabulous while it lasted. Half of Anderson is also lost in the concrete hole. Notice in aerials and in person how University is supposed to continue straight ahead, obliquely intersecting with Main to form that large triangle. This is just incredible work Howard, thank you so much. Not to take the fun out of it, but there are others, two of which still exist with their original programming. There is also a unique oval of green in the middle of Frederick Douglass which was Plymouth until Corn Hill was bastardized. As you get further from the city center the art of the public square appears to have been forsaken in exchange for the ‘let’s cram in as much housing as we possibly can.’ This was the period of the great European immigration after all. Anderson park is another good place to look at the RRCDC Charrette Plan. In that plan, University Av is reconnected to itself and the Anderson Park triangle is restored. In addition, another triangular park is proposed just to the west, between University & E. Main, which provides a great civic foreground for the beautiful school facade on University. These two parks would act in tandem in much the same way as some of the spaces that are formed where Broadway cuts across the grid of Manhattan. If you look at it, you will find mostly verbiage, some of it good, about reducing the barrier effect, improving connectivity and so on. There is only one image of what the improvements might look like, but that image contradicts the good intentions of the verbiage. I have two principal concerns, the width and the geometry of the new roadway. Width – The image shows a 4 lane divided roadway. In trying to understand the rationale, I first looked at the traffic count. According to their own figures, the combined traffic count for the existing Inner Moat, Pitkin St & Union St is no more than 17,000 VPD. I looked at my SmartCode (something all you urbanists should be familiar with – go to http://www.smartcodecentral.com) and found that 17,000VPD can easily be accommodated by a normal 2 lane 2 way city street. In fact Monroe Av between the Inner Loop & 490 accommodates over 18,000VPD. As a pedestrian who frequently crosses the Loop at Monroe & East Avenues, I think it would be easier & safer to get across the current moat than this surface level highway. In the TIGER grant verbiage and elsewhere the terminology ‘raising the Inner Loop to grade’ is often used. This indicates a very different mindset than the terminology ‘eliminating the Inner Loop.’ It is a mindset that still puts the emphasis on moving as many cars through the city as fast as possible rather than re-establishing the continuity of the urban fabric. It is interesting to note that the Inner Loop once had a section that was at grade. 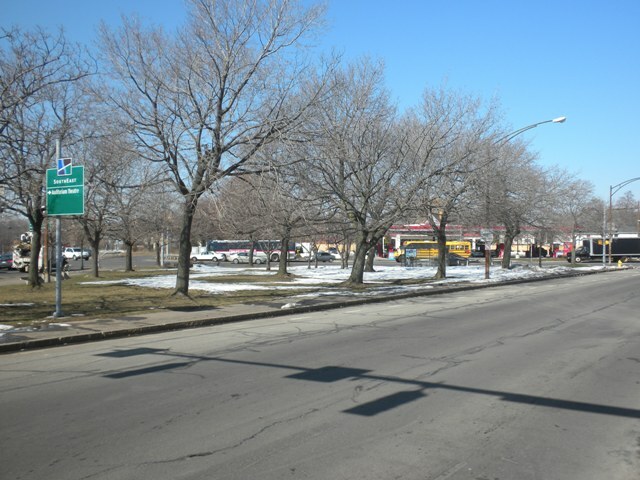 North & South Plymouth Avenues formed the western boundary of the Inner Loop before 490 W was constructed. It was much like what is now being proposed for the east side, except the median was narrower. It persisted in this form for decades after the current configuration of the Loop was constructed. The city finally reconstructed it a few years ago, in part to reduce the barrier effect! Why repeat this mistake on the east side? Geometry – The image shows an inexplicable curve away from Union St south of Broad. This would create a ‘green space’ in front of the houses on Union, but this space would not have any of the character or utility of the lost squares that are being explored in these posts. It would merely be a leftover space that would be sliced up by the extended driveways these houses would need to have access to the new roadway. It would also route the roadway along the Strong Museum parking lot, forever eliminating the possibility of developing new buildings that could screen the lot from the public realm. It seems to be a totally boneheaded move. The image does not show what happens south of Monroe Av, but presumably the sweeping, looping geometry would continue and we would continue to have an Inner Noose around downtown. I would really like to hear a cogent explanation as to why we need to keep this oversized roadway looping around our downtown and why we cannot restore something closer to the original pattern of streets and blocks. That first image is incredible. I would love to have seen that city! This is excellent, thought-provoking, heart-rending urban detective work. I’m torn between being moved deeply by all that has been lost, overwhelmed with the situation you find yourselves in, and still a tiny bit hopeful that the extinction is not yet complete; that enough remains to feed a new way of thinking about your city. Your fellow citizens need to know these stories and to take stock of what was once, and the price paid. You have the makings of a fine book here that can inspire; a college course; a series of summer walking tours; a cool program for school kids about the tangible interaction between past and present; an interpretive trail. Keep doing what you are doing. Bob – I’m on it. I will keep snooping. David, you should spend some time looking at ALL the 1919 aerials of the city made by the Army. They are really amazing – a very sobering look at a city that once was. Tim, I agree completely. For those readers who are not transit geeks, 17,000 vpd (some of us say adt – average daily trips), is not much more than a normal city street. The traffic counts for the Loop are so paltry that not only do we not need the Loop, but we do not need anything but the good old grid of streets we once had. 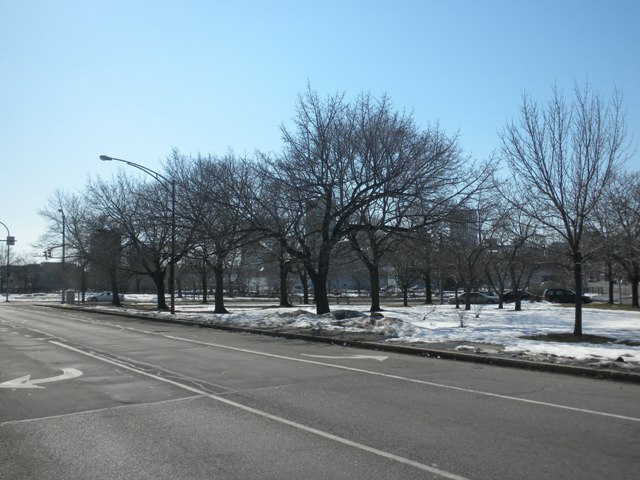 We certainly do not need an encircling on-grade boulevard – the numbers alone simply do not justify this kind of roadway. Just give us back our damn streets! And Tim – there is no cogent explanation. There are plenty of wacky explanations, and lots of little formless fears having to do with congestion and the essential nastiness of cities, but there are no cogent explanations. The argument about making the Inner Loop into the Inner Noose is about political expediency, is about coping with the anti-urban sentiments of many, about the continuing notion that free and unlimited auto travel is an inalienable right carrying no concommitant burden of responsibility to the life and fabric of the city. But it is not cogent. And Doug, thanks for the kind words. Full disclosure: Doug is my very talented younger brother, and he has a sensational blog at http://alamedahistory.org. Check it out. I find it fascinating that the beginnings of the insidious destruction of the city can already be seen in comparing the 1919 aerial photograph with the 1925 plat map. 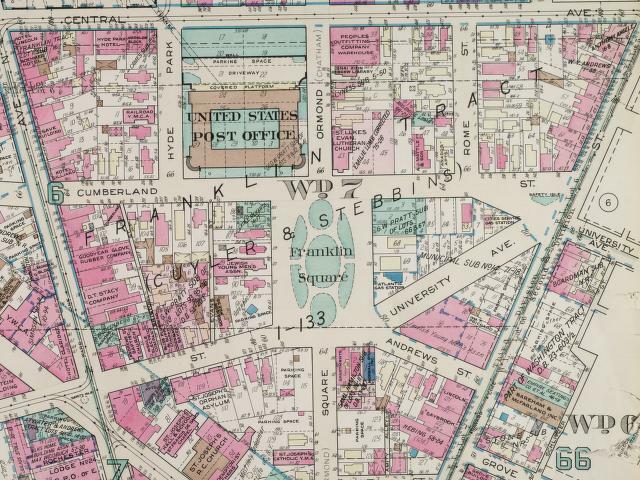 University Avenue has been cut through, Haussmann-like, between the southeast corner of Franklin Square and what was then North Street. – the sale and subsequent demolition of St. Patrick’s Cathedral complex at Platt and Frankfort Streets downtown for Kodak expansion. Accounts of this are hard to come by; it seems to be an episode that the official chroniclers of Diocesan history choose to ignore. In my searching, even images of the former St. Patrick’s are also hard to find. – the obliteration of the former courthouse square at Main and Fitzhugh by the construction of the 3rd (and present) county courthouse in the 1890s. 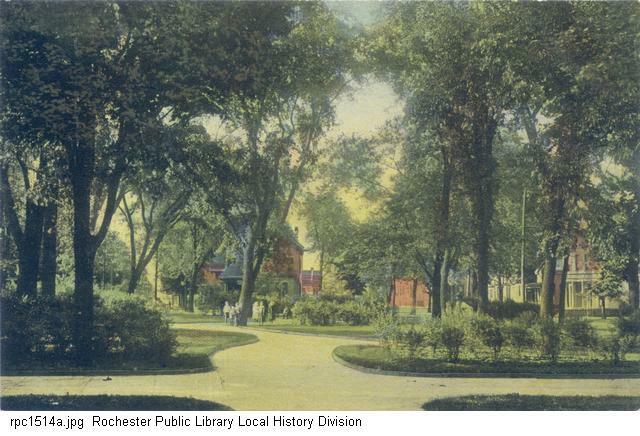 It seems the destruction of spaces that ought to be valued, whether sacred or civil, has a long history in Rochester. Jason, I have found dozens of photos of St. Pat’s, and I am now snooping around to find more information. Stay tuned. Just going through an old family album, and found a picture of what I think is Franklin Park… a photo of what looks like a class of young women posing in front of the Schiller installation. The photo is from the early 1900’s. I’ve recently discovered this post and would like to learn more. I host the Park(ing) Day event down the street in September. Wondering if one of you would like to speak on this topic this year (Thursday, 9/15/16), or suggest another speaker who might? Sara, tell me more about the event – perhaps I can help. Thank you! Can you email me, sara.jenks@gmail.com? I know this article was written almost a decade ago, but just in case anyone wanders across it, I thought it might be worth sharing that there is now (finally!) an active effort to revitalize Schiller Park. Our organization, Downtown ROCs!, is spearheading this effort, and there are dozens of engaged citizens participating. This is a great story – thanks for writing it. 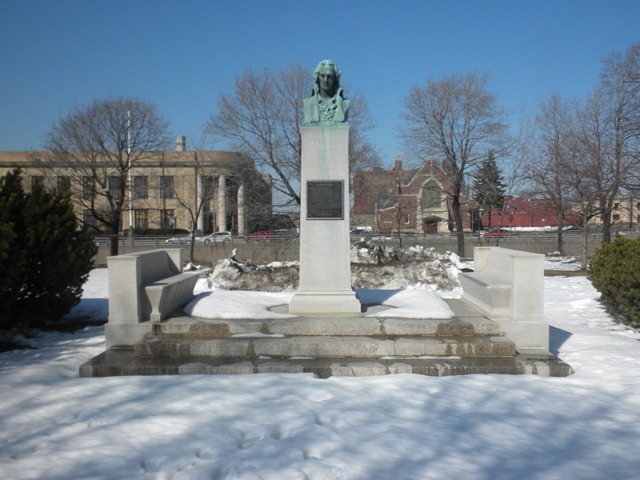 I was out for a walk downtown this week and stumbled upon the Schiller statue in the most derelict part of downtown. Its placement next to a Brownfield site, a pile of garbage and weed-infested parking lots seemed out of place. That piqued my curiosity which led me to this site. It’s almost foreign to see that part of the city once teeming with life in what surely would be a vibrant, sought-after neighborhood today. It would be great to see the Inner Loop completely removed loosening its grip around downtown. With the recent investment in living space downtown and the proximity of this open space – there is hope. For those that don’t believe, take a look at the journey of Montréal’s Griffintown from the 1840’s to today. Brian, thanks. Glad you could visit A Town Square. You might be interested to know that there is a very definite movement afoot to remove the northern section of the loop, where you found this poor derelict remnant of a great Rochester place.